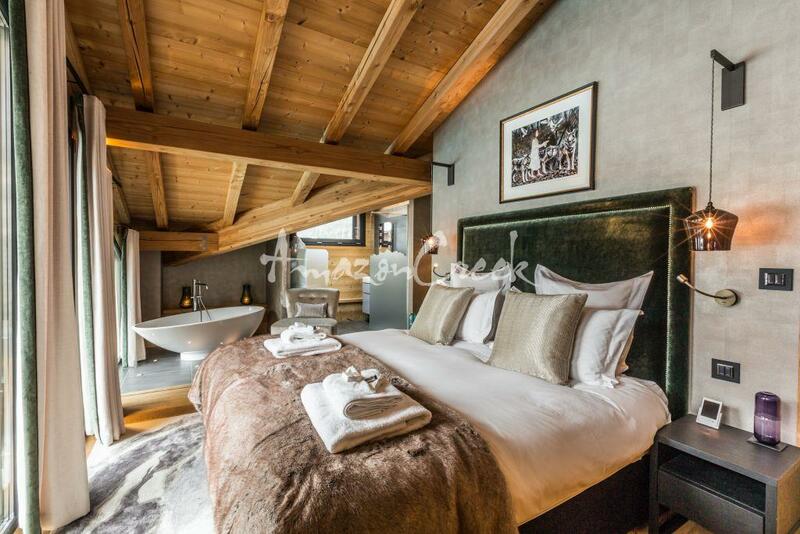 Chalet Couttet is cutting-edge modern design paired with fabulous facilities and breath-taking views of Mont-Blanc. 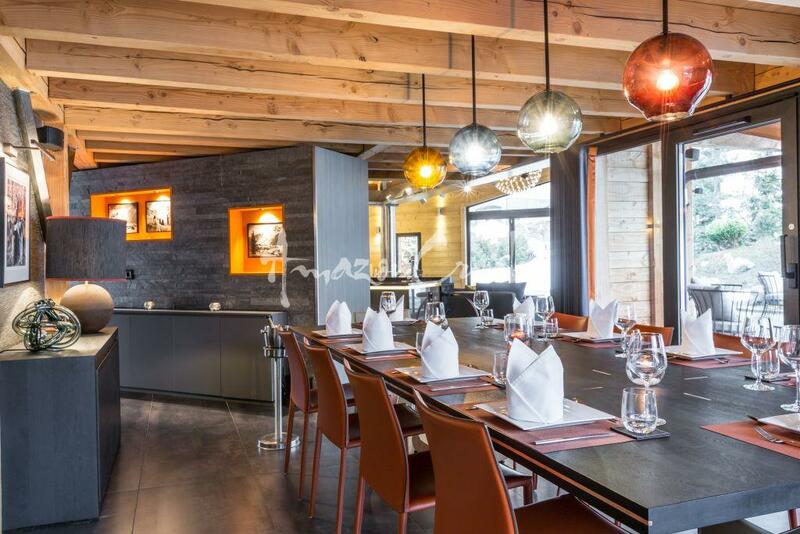 Located just a five minute drive from Chamonix in a quiet peaceful location, this five bedroom stunning chalet is the ideal choice for your luxury escape! A warm and artful designer decor ties together all three floors. 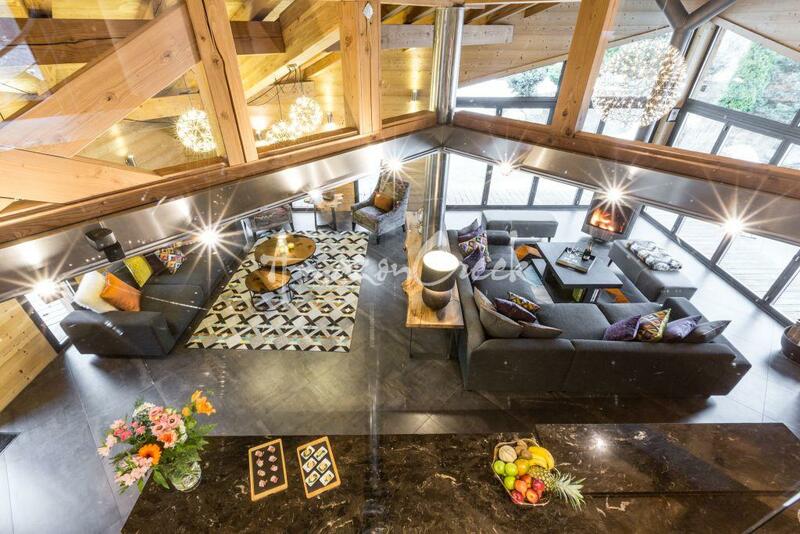 The chalet comfortably sleeps 10 guests across five individually themed en-suite bedrooms. Amazon Creek provides luxury towels, slippers, bath robes and L’Occitane products for complete comfort. 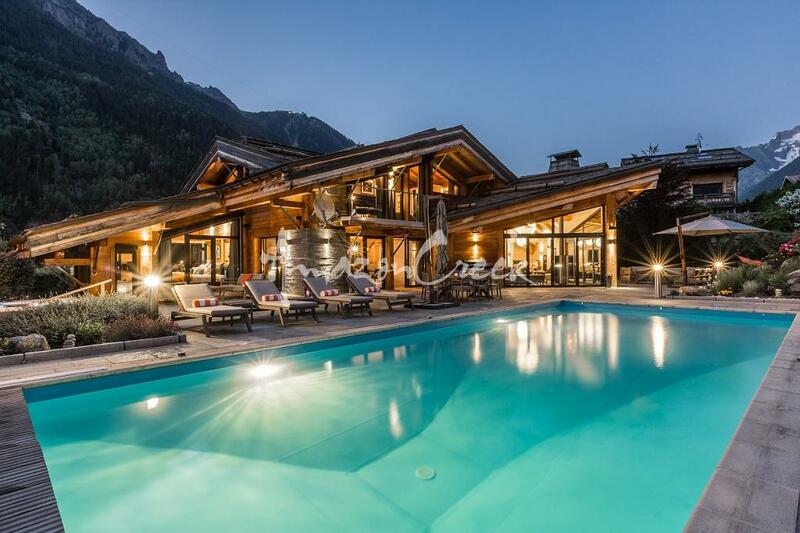 Fantastic facilities set this contemporary chalet apart with true class. A large cinema room invites cosy nights, while the games rooms complete with pool table and bar adds flavour. A spa, including private massage treatment area with two treatment tables, or for the yogis who are seeking a peaceful practice space, look no further. The spa area also hosts a sauna and hammam. There is also a gym and an outdoor hot tub. 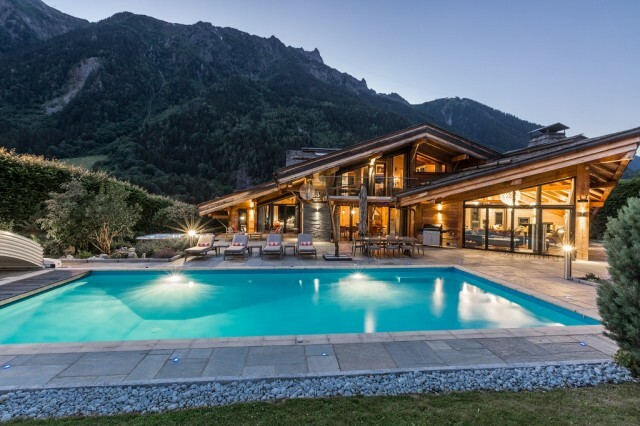 Together with the 12m heated outdoor swimming pool (operational all year round, with a cover during the winter months), Chalet Couttet becomes the perfect Chamonix getaway property to relax during all seasons. 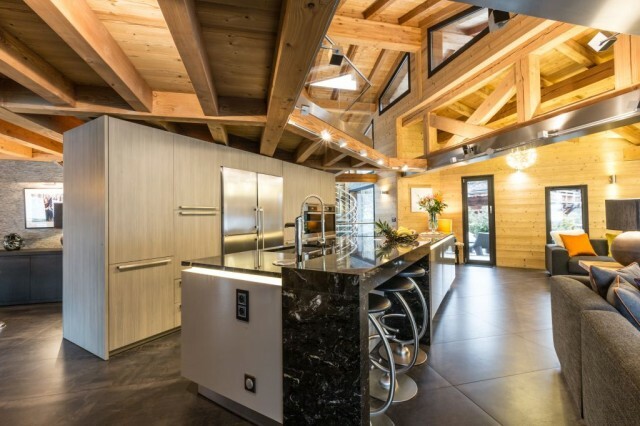 During the winter months, the large open plan living area and terrace are South facing, so even during the shorter days the chalet is bathed in sunshine. After a hard days skiing, the large eight man hot tub is the perfect place to heal your muscles. 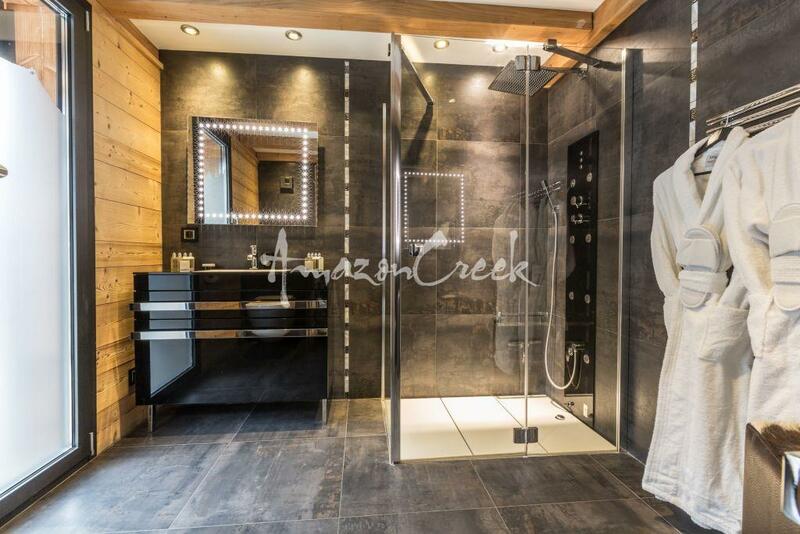 The Amazon Creek team can even book an in-house massage ready for you on your return from the slopes. Set the ambience with your favourite music playing throughout the chalet on the Sonos sound system. All while your private chef is preparing your four course evening meal. During the summer months the terrace comes complete with sun loungers, BBQ and outdoor dining facilities. The perfect space for family fun or sophisticated 'Al fresco' dining, relax in bespoke furniture whilst admiring the fantastic views of Mont Blanc. Laze in the garden, or take a dip in the heated pool, or dive into your favourite book in a breezy hammock. For the more adventurous, Chamonix also offers numerous outdoor activities such as white-water rafting, hiking, mountain biking, glacier mountaineering, golf, tennis, horse-riding, rock climbing, amongst others. A personal greeting on arrival to your chalet is the start of a long list of concierge services the Amazon Creek team are in-resort to assist you with. Ahead of your stay we are also at your disposal to plan and arrange your Chamonix vacation. For the winter months, this includes planning your private chef. We handpick exceptionally experienced chefs to provide you with seasonal menu’s personalized to your tastes. Your chef will be avaialble before and during your stay to ensure they have the best menu to suit your requests. However, as is standard, during the summer months the chalet is rented on a self-catered basis. Summer rentals include a welcome hamper and a pre-arrival shopping delivery. So you arrive to stocked shelves and a full fridge of your favourites (as well as some pleasant surprises). Fox Bedroom - Fixed double with en-suite shower room and shared balcony with penguin bedroom. Smart plasma TV. Penguin Master Bedroom – Super king size bed or twin with a freestanding bath tub, en-suite shower room and driect access to the garden terrace, swimming pool and hot tub. Smart plasma TV with Apple TV box. Wolf Master Bedroom – Fixed super king size bed, desk, free-standing bath tub, en-suite shower room, with wonderful mountain views and a private balcony. Smart plasma TV wih Apple TV box. Butterfly Bedroom – Fixed King size bed with an en-suite shower room. Smart plasma TV. Stag Bedroom – King size bed or twin with en-suite shower room, with a private balcony. Smart plasma TV.